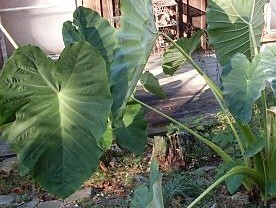 Eye catching large leaves are the distinguishing characteristic of Elephant Ears. The leaves, which get up to three feet long and two feet wide are apparent when you look at it. It is a great plant for a landscape, a large container, or even a water garden. The leaves range in color from black to green to dark purplish, depending on the variety. This is a terrific tropical plant, with an exotic look in the leaves, which grow on shoots. It is not known as a flowering plant, and clearly the leaves are its main attraction. It is most often used in a planting with other shade loving plants. 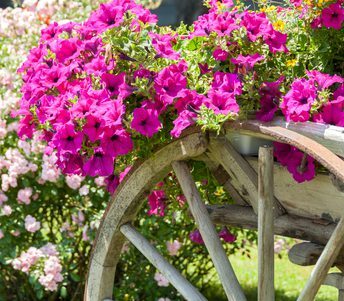 Often paired with colorful flowering annuals such as begonias and impatiens, it blends well with other plants. Elephant Ear plants need warm weather and will not tolerate cold. They should not be planted until all danger of frost has passed and daytime temperatures are consistently reaching up to 70 degrees. As such, they will be one of your later garden additions when you do plant them. But as a perennial you should not need to replant them year after year unless you are north of zone 8. Planting north of zone 8 will require digging up the tubers and storing them in a climate controlled environment for the winter, and replanting in late spring or early summer. If you are in zones 8-10 your plants will die back at the first frost of fall, but they will grow back in the spring. If you wish to begin your Elephant Ears from tubers, you can begin the process inside in pots about 6-8 weeks prior to the anticipated final frost of the season.